December 27, 2015 By Elizabeth Lindemann 3 Comments / This post may contain affiliate links. Merry Christmas, everybody! …two days later. Sorry y’all, I really dropped the ball on posting anything in the least bit festive, between getting a nasty cold a week ago and going out of town for the holidays. I hope you all had a lovely, relaxing, family-and-food filled holiday! And now that Christmas is over, and we all want something healthier, I have the perfect thing for you. 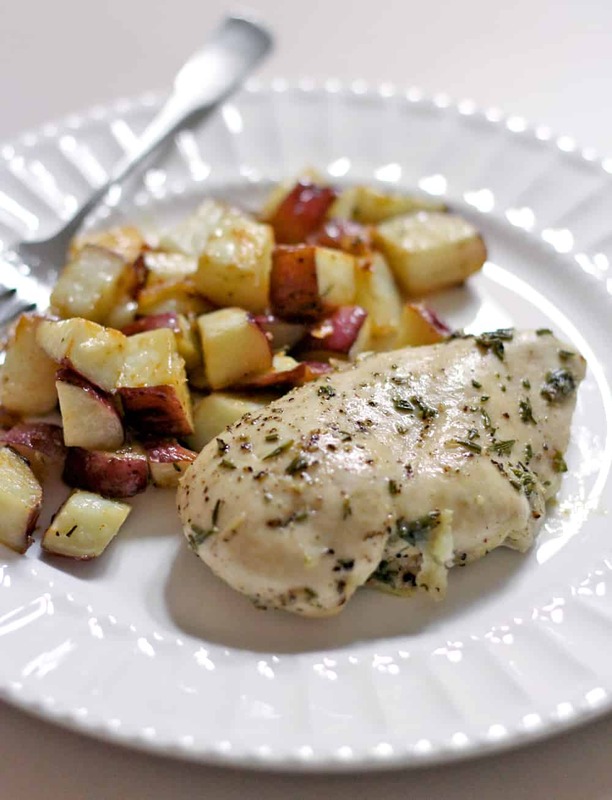 This Rosemary and Garlic Roast Chicken Breasts and Potatoes is light, healthy, AMAZINGLY EASY, and super tasty. The chicken is juicy and delicious, and the potatoes come out crispy roasted on the outside and fluffy on the inside. And it uses only FOUR INGREDIENTS (besides EVOO and salt/pepper). It’s perfection. Now. Speaking of healthy, I have a wee bit of an announcement to make. Come January 1, I, Elizabeth Lindemann, am going on a quest. I’m SUPER excited about it. I’m going to do a Whole30 challenge during the month of January!!! Well, I’m excited AND nervous. I’m not one to usually do any specific “diet” or healthy eating program. I usually just try and eat according to Michael Pollan’s famous words: eat (real) food, not too much, mostly plants. So the fact that I’m going to try something that is MUCH more restrictive than I’m used to is a bit scary. However, due to some recent health issues (that I won’t get into detail about now), I decided I wanted to give the Whole30 a shot. It certainly can’t hurt, and I’m very excited at the prospect of starting 2016 out in a very healthy way! It’s very similar to the Paleo diet- all of the restricted food groups in Whole30 are also not allowed in Paleo. But unlike the Paleo diet, it’s not a lifestyle. It’s a 30-day commitment only, and it acknowledges that these food groups (besides sugar, of course) actually can be very healthy for you- if they don’t cause health problems. The Paleo diet, on the other hand, claims that humans haven’t evolved enough to handle eating these food groups, and recommends you never have them. Nope- that one’s not for me. So here I am, with three precious days remaining for breads and pasta and beans and cheese. And as a person who loves, LOVES food, it pains me to say goodbye to these things. I’m not promising I won’t be tragically crying on January first. But on the other hand, I’m a high school teacher. Nothing scares me! And it’s only for 30 days. And one thing is for sure- if I get to eat things like this roast chicken and potatoes every day in January, I will be one happy girl! This is some serious deliciousness right here. 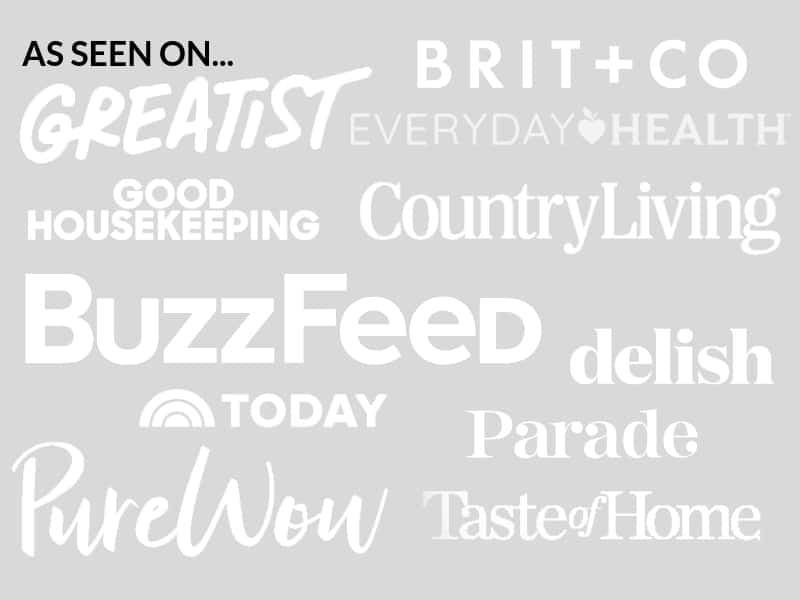 – they are inexpensive and the best, sturdiest all-purpose baking sheets out there. Here’s your Whole30 (and Paleo, gluten-free, dairy free, grain free) friendly Rosemary and Garlic Roast Chicken and Potatoes dinner. Recipe below, enjoy! 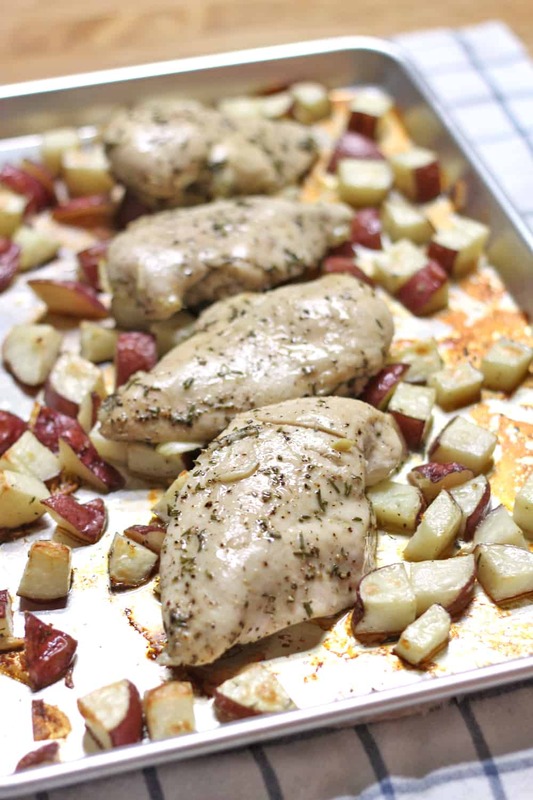 This healthy Whole30 and Paleo friendly rosemary and garlic roast chicken and potatoes dinner is SO easy, SO tasty, and uses only FOUR ingredients! 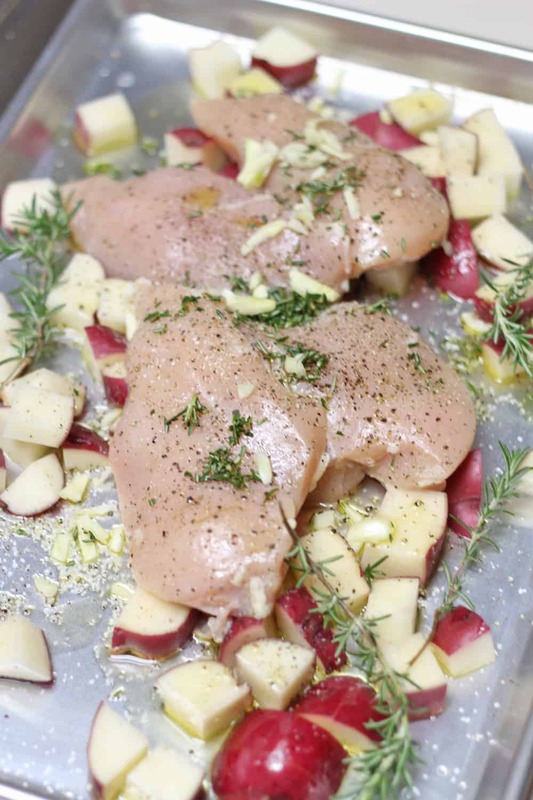 Combine all ingredients on a large sheet pan- toss to coat. 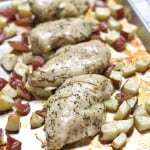 Remove chicken and set aside on a plate, turn oven temperature up to 500, and continue roasting potatoes for another ten minutes (or until turning golden and crisp). I made this tonight and wowza! Not only was it easy and delicious, it made the house smell oh, so good! Thank you :) Bookmarked at the first bite! Yum!! This sounds so good!! I could definitely make this with ease one night after work!